Winter on Fire: Ukraine’s Fight for Freedom opens in October 2015. I saw it at a festival in September. The events depicted in the documentary took place in November 2014–February 2015, so the fact of its existence, mere months after the event, is an impressive testament to filmmaking technology. But it wouldn’t mean a thing if the film weren’t powerful. Winter on Fire is a documentary that rarely shows a talking head. Occasionally we will see someone, dressed once again in their civilian clothes, out on the streets of sunny Kiev, recalling the time when thousands thronged the streets in protest. 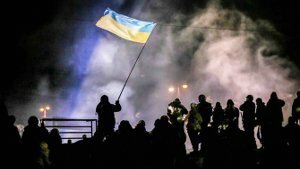 The lightning strike that sparked the protests was a last-minute decision by president Victor Yanukovych to reject a bid for Ukraine to join the European Union. Instead, Yanukovych pulled Ukraine back toward Russia, politically speaking. The protests in Kiev’s Independence Square start simple, peaceful, and small. By the way, I think the documentary is too quick to choose sides. In light of what followed, it’s right that this film do so, but it pushes the audience before we’ve had a chance to grasp what its all about. As in Egypt, the protests escalate. The Yanukovych government retrenches. After 2 weeks of unrest, the European Union and the United States send diplomats in search of a peaceful solution. Nothing comes of the visits. Then the pushing starts. A church in the square sees the tension and tries to inject a little perspective. It rings its bells, all night long, for the first time in nearly 800 years. The Government reacts to the protesters with new laws against protesting. Since many protesters wore hard hats, there is a rule against hard hats. So people come to the square wearing pots and pans on their heads to show their disdain of the lawmakers’ superficial thinking. For months the tension escalates. The protests turn into a kind of turf war, with marchers trying to get to government buildings by moving along streets, and police trying to push the protesters back. Another dirty trick: the Berkut — the government police — destroy what had been the medical station for the protesters. Lastly, toward the end, the government resorts to snipers firing live rounds, shooting even at people sent in to recover the bodies of the dead. If you want to know how it “ends” you can read newspaper accounts (though I don’t think anyone feels like the situation in Ukraine is really resolved). The filmmakers come back to many of the same participants over and over. One of them is a 12-year-old boy. Ironically, he illustrates exactly what’s wrong with the protests. When he’s on the screen, I felt a little guilty siding with the protesters. The kid criticizes Yanukovich in the way a 12 year old would, calling him a bad man, repeating the critiques he’s heard adults around him make. Later, he describes the making and use of Molotov cocktails. His young presence is an alarming cautionary reminder that “the good guys” mustn’t let the protest devolve into over-simplistic generalizations. If the protesters aren’t careful to acknowledge that even the Berkut are fellow Ukrainians in front of their kids, they risk creating a thoughtlessly violent generation. Maybe the presence of the kid made me start to wonder who the helmeted, vested, baton-wielding Berkut are. Don’t they know that if wearing a combat suit and beating civilians automatically puts you on the wrong side of history? I’d love to learn what their pep talks sound like, whether they’re in it for the money, or if they’re fighting out of a sense of loyalty to a leader. A friend speculates that maybe they think they’re the last line of defense between civilization and chaos. If so, it seems they haven’t really thought it through very carefully. From what I have read I know that there are Ukrainians who feel more Russian than European. Their voices are not present in Winter on Fire. That’s probably a wise decision for this film, which focuses only on the the protests in “Maidan” — the square in Kiev. But it’s useful to keep in mind that this story takes place in a larger context, that this is only a sliver of the big picture. That said, Winter on Fire is an exciting documentary full of the raw emotions of injustice and tyranny. See it if you want to witness a living history lesson. But maybe you should think twice before bringing your kids.